Humira is an antibody that is injected into our bodies through a surface injection. Humira is believed to prevent the harmful inflammatory conditions caused by the tumor necrosis factor alpha (TNF alpha) in various arthritic conditions and Crohn’s disease of the intestine. When our body is injured, it produces an inflammation in response to the injury making it possible to repair the raptured tissues. The body responds to the inflammation, by producing TNF. Humira was produced in 1993 by through a scientific corroboration between Bioresearch Corporation and the Cambridge Antibody Technology. After the prototypes, the mass production and product marketing was handed to Abbott Laboratories, after it bought the pharmaceutical wing of Bioresearch Corporation in January 2013. Abbott Laboratories was to later split into two different companies; AbbVie and Abbott. AbbVie took over from BASF for future manufacture, development and marketing of Humira. 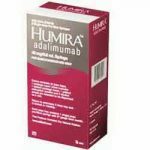 How Does Humira (Adalimumab) Work? Humira works the same as natural antibodies secreted by the immune system. It specifically isolates and bonds to the harmful TNF alpha. TNF increase the inflammation and the signs resulting from the inflammation; fever, tenderness, pain and swelling of the joints (arthritis) and fever, abdominal pain, and diarrhea in Crohn’s disease. Inflammation in our joints leads to week joints worsening the cases of rheumatoid arthritis. Humira is available only on prescription and is administered through a subcutaneously injection once a week or once in a fortnight depending on the disease. You should NEVER overdose and if it happens accidentally, consult your caregiver immediately. Humira (Adalimumab) costs approximately $1,662 per month! Several clinical studies have been conducted on Humira to determine effectiveness, side effects and drug interactions. Is Humira (Adalimumab) Right For You? Humira is a well researched prescription product. However, it has numerous side effects and the different clinical studies differ when it comes to turnaround time. Unless this is your last option and only in severe conditions, Humira might not be the right product for you. Nevertheless, it is a prescription only substance and thus you should consult your caregiver. What Should I Expect When Taking Humira (Adalimumab)? Humira has quite a decent turnaround, but it comes at a painful cost and risk. As much as you will expect positive results, you should also brace yourself for the side effects which range from mild to severe. Will Humira (Adalimumab) Show Results? The turnaround time is anything between 24 hrs and two months periods. In cases of mild pain, the product will work within a few days. Sustained usage is paramount for the healing effects to last. As much as Humira is effective to treat joint conditions, it is very expensive and has very many risks. It should only be used when all other natural supplements have failed!